Happy May!! 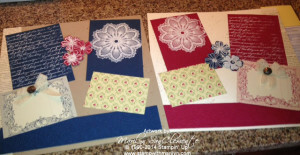 One of my Stamper’s Groups had asked for a Vintage class with a scrapbook page and a couple of vintage cards. I cased a couple of vintage ideas from Pinterest and of course changed them up a little for the stamp sets that I have. So saying goodbye to the Medallion stamp and Midnight Muse in-color. I will miss this stamp set and the midnight muse card stock! Here are the details for this page. The Background is a piece of 12×12 Crumb Cake Card stock. 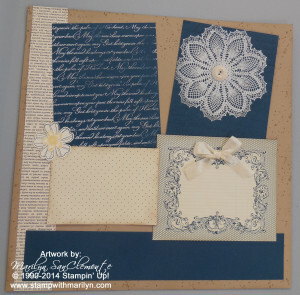 I distressed the background piece with the stamp set Gorgeous Grunge and Crumb Cake Ink pad.. The Medallion is stamped with White Craft ink onto a piece of Midnight Muse and embossed with white embossing powder. I used a very vintage designer button on the center of the medallion. The Designer Papers on this page are also retired. There is a 1 1/2″ strip o f the newsprint designer paper on the left hand side of the page. The journaling box is a piece of Designer paper from the Print Poetry Paper Stack from the Spring catalog last year. The Midnight Muse mat on the top left of the page is stamped with the retired background set – Irish Blessing. I thought that I had pulled out the retiring set – En Francais – but must have pulled out the Irish Blessing instead. 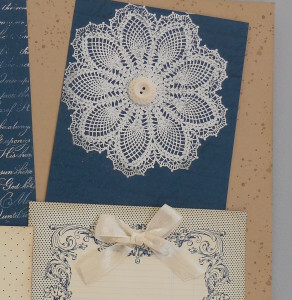 I added a flower stamped with Flower shop stamp set (not retiring) and added this to the page as an accent. So here is what my one of my Stamper’s Club members, Joyce made using this layout. Each person made the page layout their own!! 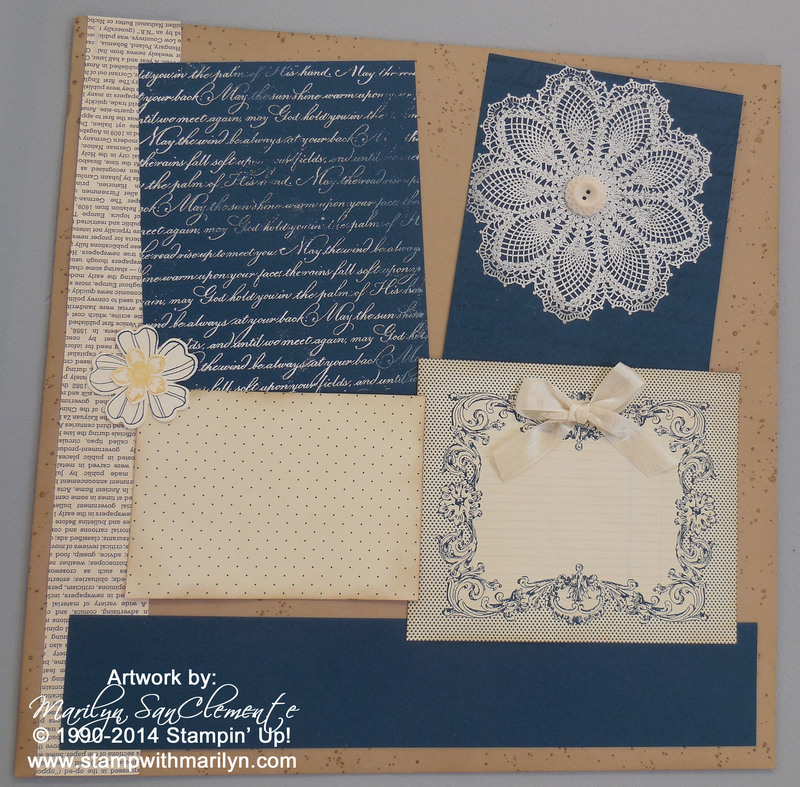 Joyce made the layout a two page spread using Very Vanilla card stock as the second page. She took the matching pieces of Designer paper but in Raspberry Ripple, another retiring in-color. I like the way Joyce stamped the Flower Shop flowers on Midnight Muse and Raspberry Ripple scraps and placed on side-by-side pages to tie the two pages together. Interested in joining my Stamper’s Club?? Members of my Stamper’s Club receive full step by step instructions and a technique video for the designated projects each month! And one month you receive the hostess benefits which is a minimum of $30 in FREE merchandise! Check out more information here. Stay tuned for one of the vintage cards that I made later this week! Happy Stamping!